It's not every day that you get asked how big your chest is by a man 20 years your junior. In this instance it was neither cheeky or pervy, Colin my coach was simply ordering my GB kit and as such didn't receive a slap! Despite being on a team GB winter training camp It was only at this moment, when uniform was being ordered, that it dawned on me I was actually part of 'team GB'. The winter training camp was the first camp for the new para canoe squad and I was suitably nervous. 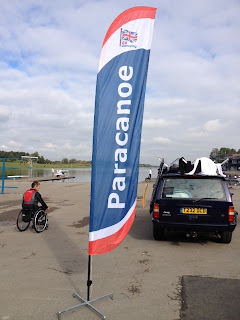 I had only been kayaking for 3 months and here I was amongst the best para canoeists in the country- in fact the world. In this squad of 20 there were 4 athletes who had won medals at last years world championships. Just a little daunted doesn't even come close to how I was feeling! Looking around I was struck by the diversity of the group. Almost every demographic box had been ticked. All so different and yet united by some event in our past which had changed our bodies and our lives. We all sat there- some in wheelchairs, some with prosthetic legs, some with wiggling stumps, some with crutches but all athletes with an incredible mindset that anything is possible. We could all have decided after our injury that we were a victim of circumstance and put our 'glass half empty' down on the table. In contrast, everyone had raised their 'glass half full' up high, in celebration of what we yet could achieve. The week was divided up into water sessions, seminars, gym sessions and testing. I'm now getting used to the fact that I am constantly going to be tested to make sure I am improving. The first time I went to this gym was 3 months ago I couldn't even lift the bar without any weights on it - what a total wimp! I have spent considerable time down the 'other' end of the gym at home- No more am I at the end full of ladies in matching gym kit who check the mirrors regularly to ensure there is no makeup slippage or VPL. I'm now pumping iron in the smelly end of the gym. I am surrounded by men in baggy sweat shorts who's arms no longer hang vertically. The sleeves are torn off their t shirts and they gaze into the mirror to ensure that their shiny biceps are getting bigger. My hard work has paid off, I manage a new personal best both in the gym and on the water! My ethos is black and white, do it or don't. So when the coaches say give it 100 % -I do just that. By day 4, I couldn't even take my t shirt off as my arms were so stiff and sore- my core was exhausted and it felt more like wet pasta than muscles of a 'finely tuned' athlete. Despite being in shreds, I had a brilliant week! My highlights were having a training session alongside the face of GB para-canoe and treble world champion. I had a - "ooo crickey, this is surreal! " moment as we paddled down the lake together. The bigger highlight however was getting to know my team mates. What a fantastically brilliant, uplifting bunch of people. Everyone should spend time with a squad of para athletes in the hope that some of their spirit, determination and irreverent sense of humour might possibly rub off on them. "I want to be the first person to cycle the South Downs Way triple, what do you think? " He was still looking at me intently and I realised he was being serious – and he wanted an answer. "Really?" I said “Sure – why not!”. He smiled and I realised that he had already decided he was going to do it. He was just testing me to see if I would be there for the journey. 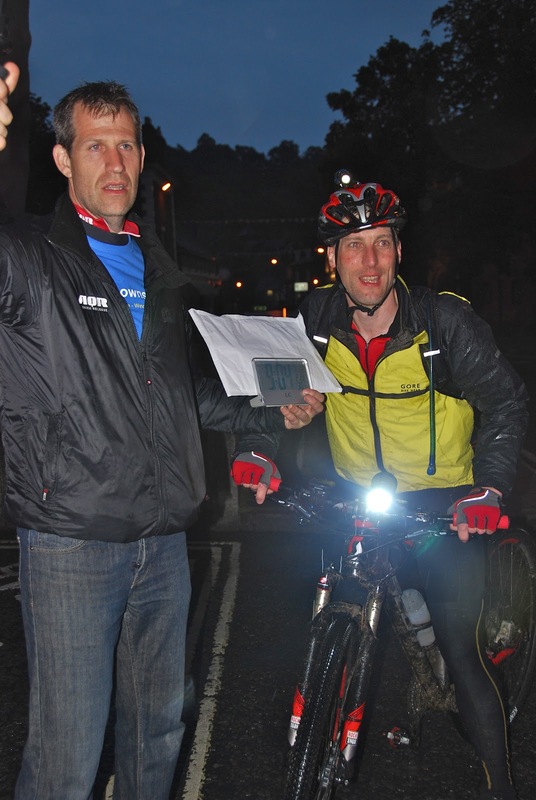 The rulebook for the South Downs double hall of fame states that there are 2 categories - supported or unsupported – yes some people do the 200-mile double unsupported. Riding 300 miles off road in one go? Slightly crazy in its self, but to ride it unsupported would be crazy verging on dangerous. As the team came together we all wanted Richard to achieve his goal, but understanding the seriousness of his challenge we wanted to make sure that no one got hurt in the process – neither Richard, who was clearly at risk, nor any of the crew, who would also be getting fatigued driving for 36 hours on public roads. This was going to be a supported ride and, having some experience of 24 hour endurance racing and some personal experience at things going wrong, I volunteered along with Simon to coordinate the support. 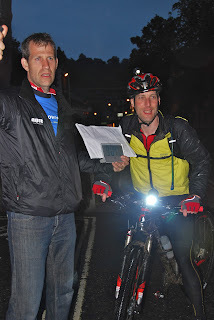 That conversation was 15 months ago and last weekend he set off from Eastbourne to attempt to ride the South Downs Way three times in one go - 300 miles nonstop, including 30,000 ft if climbing, in a target time of 36 hours. Richard is a planner, dare I say the spreadsheet king. He likes to know everything in advance to the minutest detail. Over the next 15 months he updated his massive file from his previous double achievement with information on the challenge. Photos of every gate and junction from both directions, average prevailing winds, every checkpoint with an aerial view. The location of 24hour supermarkets for emergency supplies for the crew or for if things weren’t going to plan. 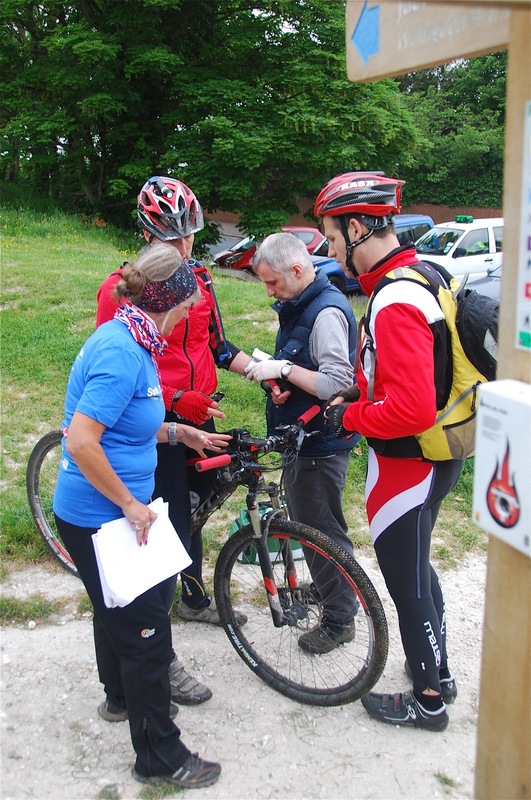 Each check point had instructions of what he wanted, his nutrition, his clothing, his desired average mph – even when to text his wife! Every situation and possible problem had been thought through with contingencies being planned. Everything and I mean everything was in that file. Planning didn't stop there, Richard, despite having a full time job and a family, found time to train efficiently and intelligently - it wasn't just about the miles and the hours – it couldn't be. 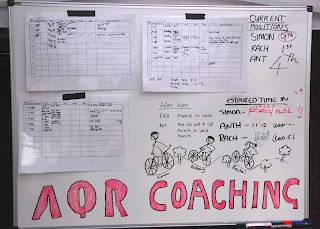 He enlisted my help to work with him on his core, and to help correct muscle imbalances we picked up in his core assessment, as well as Kate Potter from AQR coaching to work on fitness, skills and (between us) on bike fit. The dynamic core assessment revealed issues which would have led to injury, either as he ramped up his training or as fatigue set in on the ride, if left unchecked. Working with Kate, Richards training involved specific exercises to rectify this as well as to develop a strong dynamic core, to help with performance and efficiency. Kate devised a specific training program both to deal with the specific challenges of the triple as well as to take into account Richard’s work and home life commitments. So on to the support plan. Both Simon and I know 24 hour racing, but 24 hours with a fixed pit is easy. 36 hours with a demanding, moving pit was a completely different challenge. Enlisting support from the other half of AQR’s endurance race team, Ant and Rach both being experienced in 24 hour races, meant we could plan to work in 2 overlapping shifts, to make sure we didn’t get too tired. 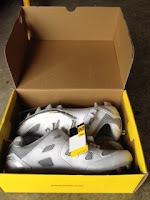 I was also particularly conscious of the potential for something to go wrong medically and although I am reasonably well trained, I am no sports doctor. We consulted with numerous experts as to the possible problems we might encounter and done everything we could to minimise risk. 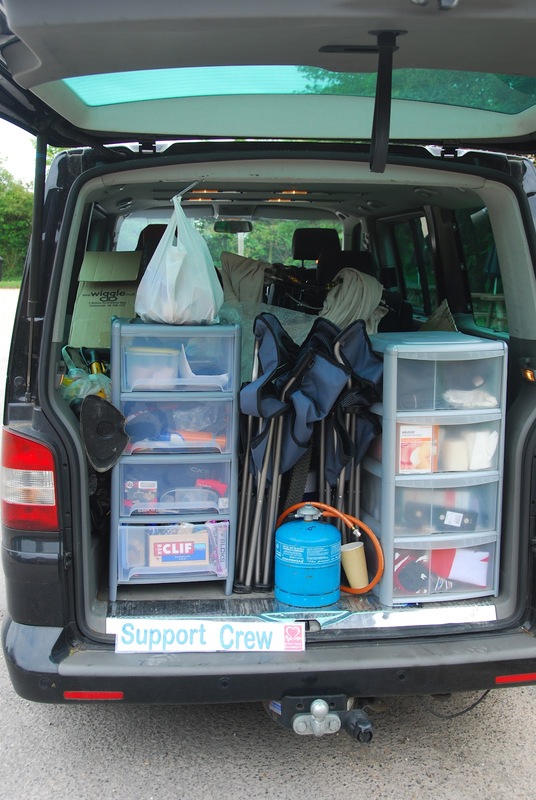 The final team was made up of a support van, a camper van, 4 support crew, a Physio (me! ), a sports med doctor, and a team support riders for the last leg – to make sure this crazy idea was as safe as possible. With all this meticulous planning a date was set – Sunday the 3rd to Monday the 4th June - what could possibly go wrong? A surprise storm coming in after 2 weeks of dry weather meant that the South Downs Way would turn from being perfectly baked to being treacherous, slippery and gloopy. 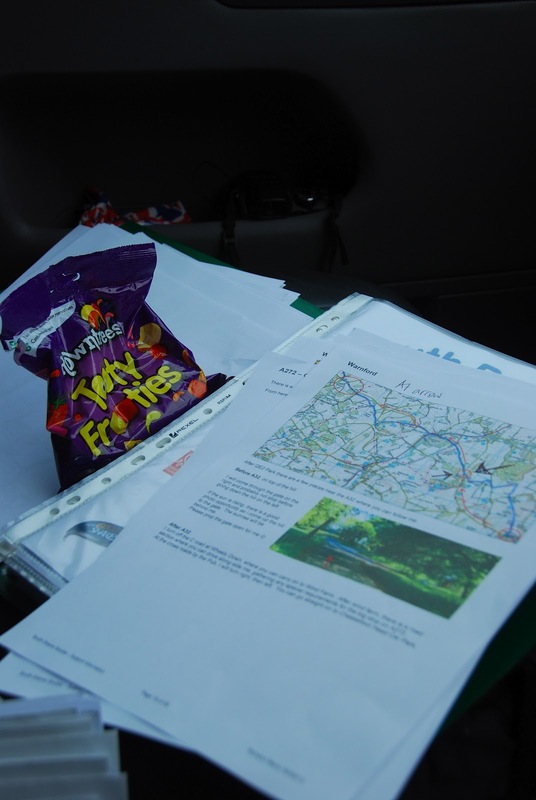 As the forecast firmed up Simon, in charge of logistics, calculated that the best weather window meant pulling the whole thing forward two days – this was on the Thursday morning, which meant we had to go tomorrow. A few phone calls later and it became apparent that a Friday start meant that more than half the team physically could not make it. 15 months of planning thrown up into the air - panic! I frantically looked through my contacts to see who might be able to stand in. Bingo! Judy and Roy from Dark Star Brewery’s endurance team. They were local, also knew the endurance scene and amazingly they were free. We scrabbled round trying to get more support riders who were free, but with this little notice on an extended bank holiday weekend it was proving a struggle. Almost sorted and then another phone call from Simon. "We are also changing the route” The normal prevailing wind is from the West, but the storm coming in was bringing in a strong Easterly wind for the final leg, which didn’t make sense to ride into on the final leg, so all change to as Eastbourne start rather than Winchester argh!!! By the end of the day my hair was pulled out and lying in a heap on the floor and my byro chewed down to the nib. 37 hours after the start, Richard cruised into Winchester. 15 months after that “innocent question” he had done it; The first person to ever to cycle the South Downs Way three times in one shot. The last 37 hours had been utterly brilliant, incredible, scary and exhausting and Richard had been absolutely amazing. 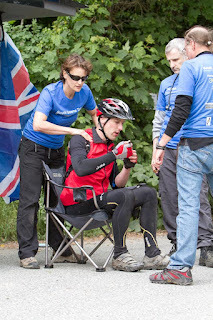 Richard at a checkpoint receiving physio and food. The hours and months of preparation and planning had been worth it. For sure Richard had ridden into the record books, and I don't know many people who could have done that, but the pit crew had been kept busy and not everything had gone to plan. 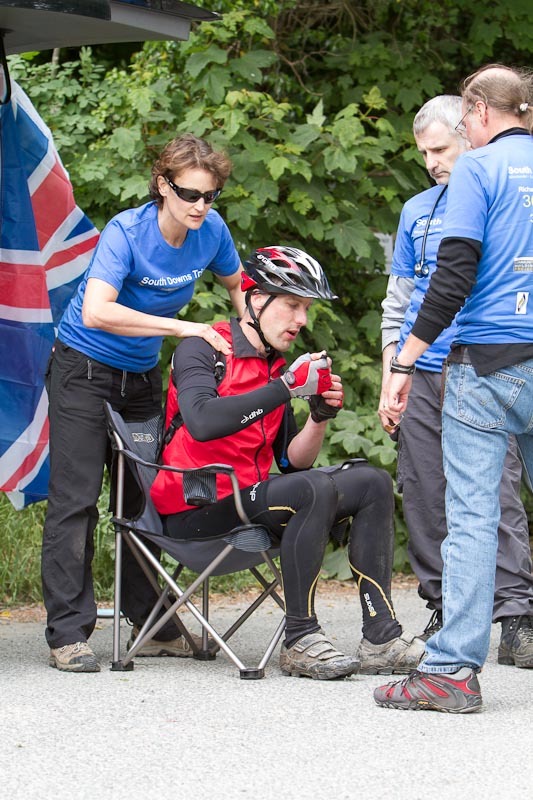 In the end there were seven core members of the support team as well as support riders making sure he was safe. Every single member of that crew contributed and just about every “what if” scenario came into play. in particular I would have hated to have been the one to take the call on whether to stop Richard from continuing when he started to waiver with 60 miles to go. A professional sports medic performing a medical exam and testing for cognitive reasoning confirmed his body was functioning normally despite being exhausted, is just the kind of reassurance we needed; and a fresh set of crew with fresh brains to take on driving duties and question decisions was invaluable towards the end. So a marker has been set and no doubt someone will try and break it. I know Richard is in many ways an ordinary bloke who has achieved an extraordinary thing, but please don't be temped into thinking it is easily achievable. If you, like Richard, wake up one day wanting to ride a long, long way without sleep, please grab that thought with both hands and say Yes, but also be aware of the dangers involved. Plan ahead, make your body the best that it can be, get yourself a crew who can look after you, and plan for everything! Remember, it’s about breaking a record, not breaking yourself… Good luck! Judys blog is here to give you the other side of the story. 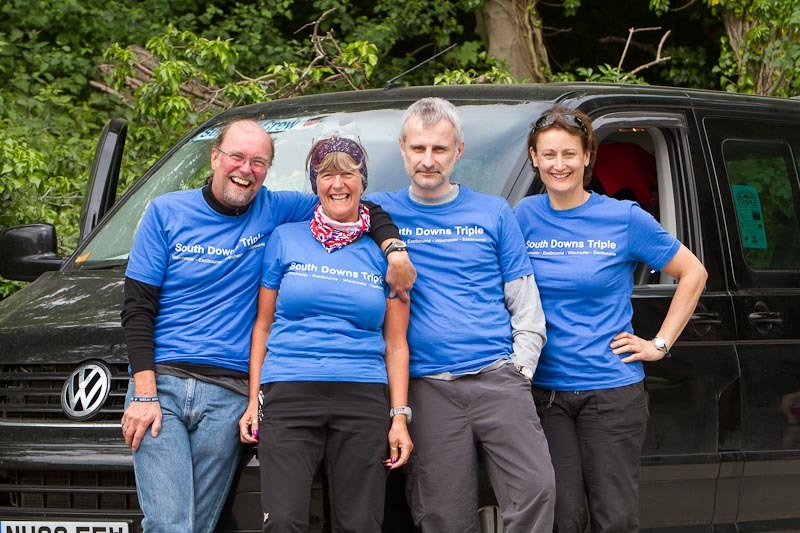 Judy and Roy from the dark star brewery endurance team who dropped everything to help us - they were absolutely awesome! 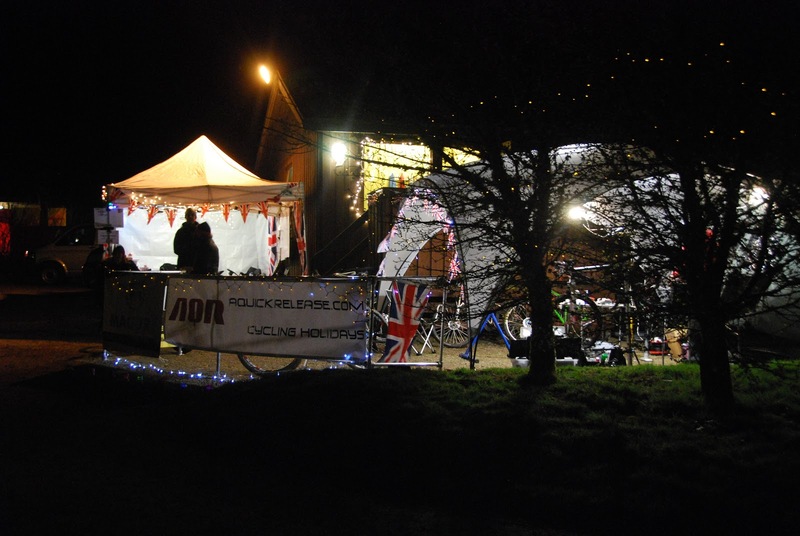 Solo 24 hour racing-team or solo sport? The injured nerve in my back has left me with a numb foot and weak leg muscles. Mother nature has her own healing time and frustratingly I know there is nothing I can do to hurry this healing process. I have had to bury racing goals along with my new, unused race shoes in the bottom of the cupboard. I have tried to be upbeat about it because in the great scheme of things I am fine - at one point I was worried that I might not be able to walk at all. So the fact that I am mobile, back at work and even riding my bike (albeit in variable straight lines with unpredictable steering) is brilliant. 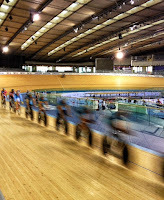 Seeing other people around me training and racing has been hard. Forced to stay at home while my riding buddies thrash their bikes around the woods and listening to their excited banter when they come back makes me feel like an an outsider. How was I going to pull myself out of this dark, lonely place called injury? 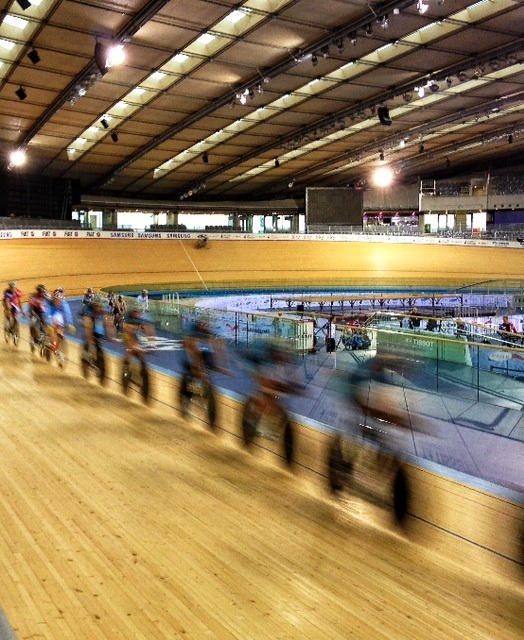 Two months ago I was lucky enough to work as track side physio at the Olympic test event at the London velodrome. The event was incredible! Since joining AQR's race team, the Exposure 24 Solo Championships have been a key event for me. Being the only event dedicated to my particular discipline it has been the highlight of my calendar. Sadly, this year, I wasn't able to race. My AQR endurance team colleagues and close friends Ant and Rach were both entering, and I had also persuaded Simon (who normally supports me) to enter the 12 hour with me repaying his support. But I wasn't really looking forward to it. This was partly because it is my favourite race and I wouldn't be on the course, but it was also because I am rubbish in the pit - or at least I was the last time I supported Simon. 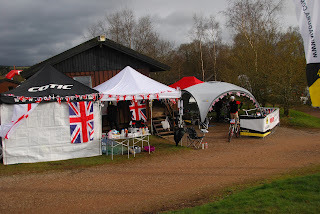 In fact I was so bad he ended up grabbing his own bottles and gels! So here I was, supporting three of my closest friends in the pit feeling immense pressure to do a good job. 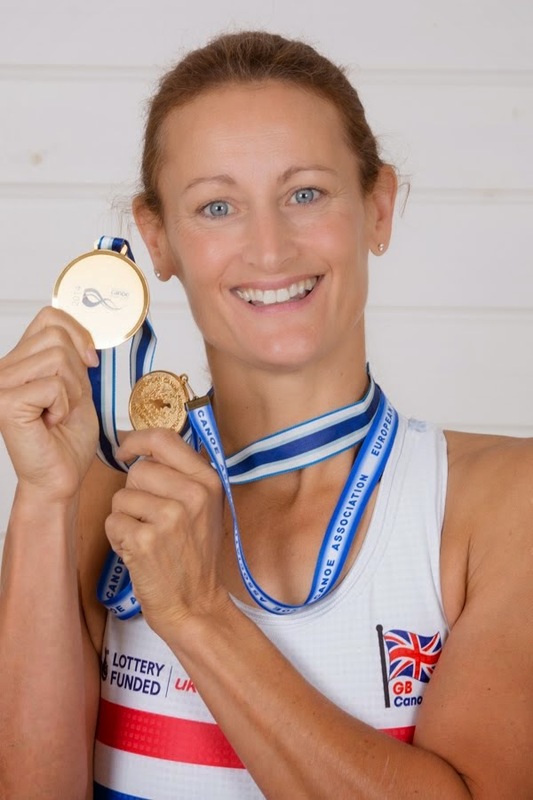 Rachel had fractured her pelvis last year requiring physio alongside her training to enable her to push hard while keeping her body repairing properly. Her goal was to race at the 2012 24hr champs and give it her best shot. Simon fell off his bike (road riding is so dangerous!) 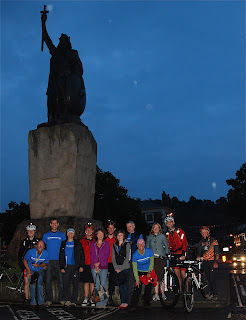 4 weeks prior to the race hurting his back and knee making walking painful let alone cycling for 12 hours. He ended up spending more time in physio than riding his bike on the lead up to the race and his goal had become purely to get a top 10 finish with a smile on his face. Both their goals were a long shot but I was determined to help as much as I could. The race day arrived and I was a bag of nerves just as if I were going to race! 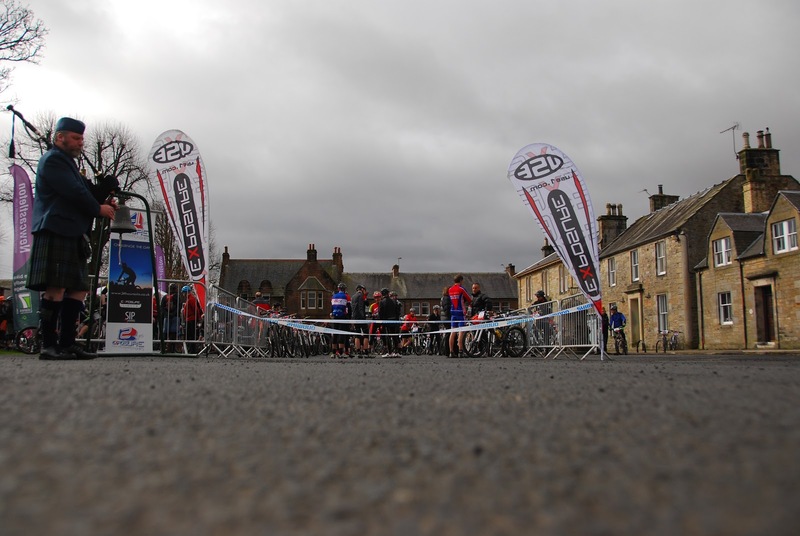 Getting to the start of the race in a minibus shuttle rather than on my bike and standing at the start holding a camera rather than a bike was a stark reminder that I wasn’t racing - so why was I still nervous and still needing that 'pre-race panic' toilet stop!? Back at the pits I kept checking and rechecking the riders race instructions. From a riders perspective I knew how crucial it was that I didn't get anything wrong. One, two, three successful pit changes. I started to relax and enjoy myself. Rachel rode her socks off. We had talked at length during her rehab sessions how she was going to ride this race with her recovering back and pelvis and it all went to plan. Some fairly interesting pit stops through the night involving a lot creative tape application to support the areas we are still working on helped Rachel to finish well ahead of all the competition. As she crossed the finish line as National and European Champion I couldn’t have been more elated. As I stood there and watched our riders stand on the podium I felt an immense sense of inclusion and pride (Ant had come 3rd in the U.K). Solo racing done well is very much a team race. What I learnt that weekend was that just because I wasn't racing didn't mean I couldn't be a valuable part of the team. If I had raced - only one person might have had a successful race. 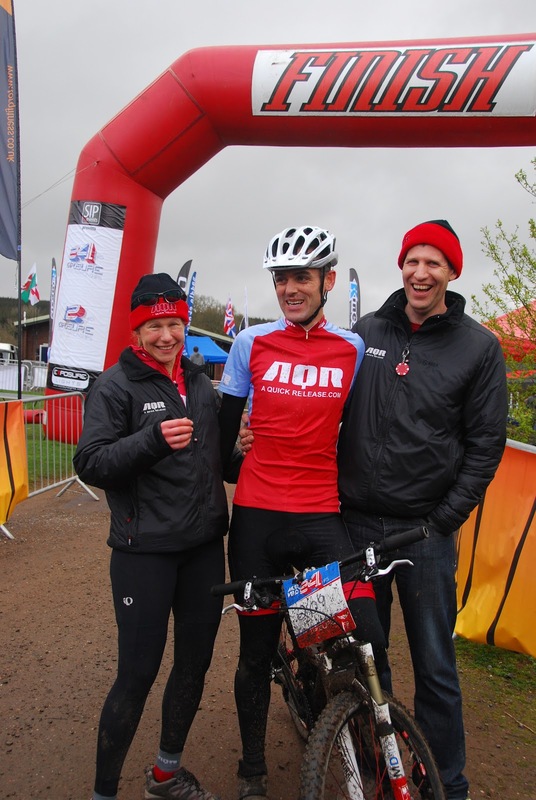 Being race physio and Simon's pit monkey meant that I was part of a team that helped several racers over the finish line. 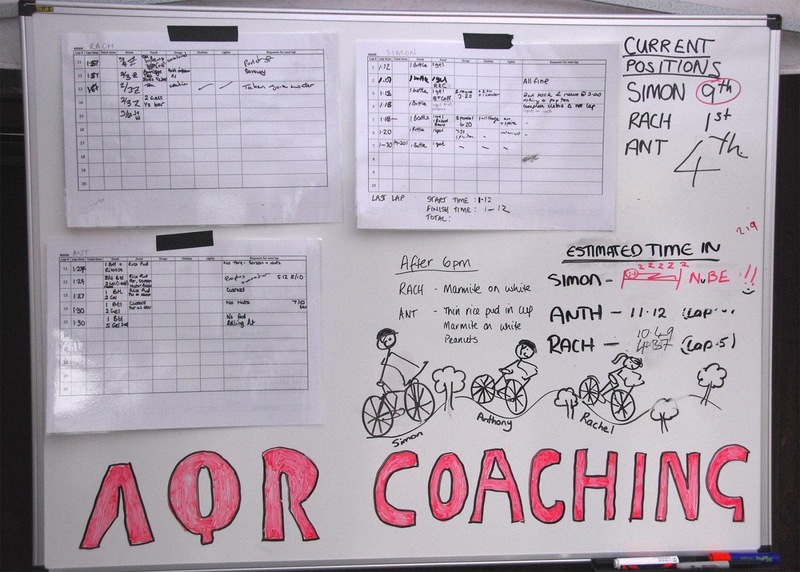 Coaches Kate and Ian Potter for all their hard work before the race with coaching, skills tuition and performance bike fit. 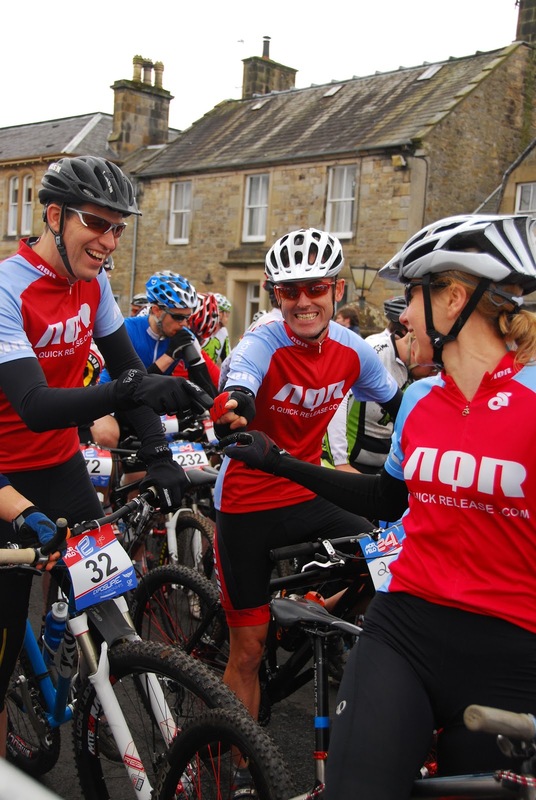 Cheerleaders and Bell ringers Kirsty, Matt and Katie- other AQR riders who came a long way to support us.